So you think you've heard everything possible regarding how to save your agency from E&O claims? This book will challenge that presumption. Even if you've heard and read every protective measure possible, have all your employees read and heard every protective measure too? This book presents 50 tips in practical settings with practical solutions without getting into the minutia of policy language and case law. In other words, this book can be used every day throughout the entire organization to reduce the agency's E&O exposure and also to increase the quality of service the agency provides. In fact, this book can even be used to improve procedures on a weekly basis. Just choose one item per week to discuss during lunch and use it as training and/or a basis to modify your existing procedures. The book is written to be used and referenced rather than just being read. 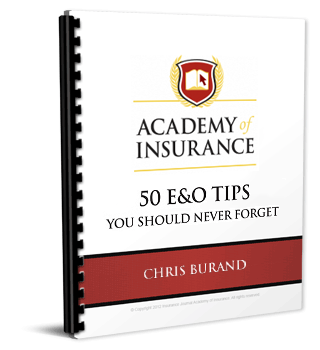 You will not find a more user friendly E&O book.